Democrat Christine Quinn threw her hat into the ring Sunday to become New York's next mayor, in a race that could see her become the first woman and the first openly gay person to hold the position. Quinn, who currently is speaker of the city council, is vying to succeed Mayor Michael Bloomberg, who has held the post for 12 years. A general election vote to succeed him is to be held in November. 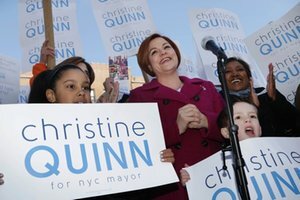 Christine Quinn, New York's First Female Mayor?